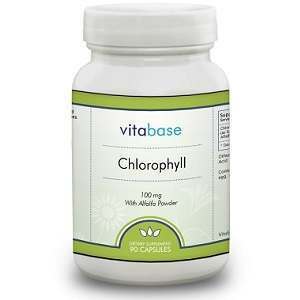 Vitabase Chlorophyll tablets are designed to contribute to overall health and wellness. Known for its high concentration of antioxidants and magnesium, chlorophyll supports a number of different functions in the body. It is also used for improving bad breath. Each tablet contains 100mg of chlorophyll and 250mg of alfalfa powder contained in a gelatin capsule, with stearic acid as a preservative. Chlorophyll is the green pigment used by plants to generate nutrition by converting sunlight into energy. Not only is it high in antioxidants, it is a good source of Vitamin A, Vitamin C, Vitamin E, Vitamin K, magnesium, iron, and essential fatty acids. Because of this, it helps to restore red blood cells, helping to carry more oxygen through the body. Alfalfa Powder is a natural source of a number of vitamins and minerals including Vitamin A, Vitamin D, Vitamin E, Vitamin K, as well as B vitamins, iron, magnesium, and potassium. Regular consumption of alfalfa can help the body eliminate toxins, and has a mild diuretic effect. This makes these two ingredients useful for cleansing the body from the inside out and preventing odors. Vitabase recommends taking one capsule between one and four times per day. There are no recommendations for people who should avoid this product. As its contents are completely plant-derived, it would seem safe for general use at low doses. The gelatin capsules make this product unsuitable for vegetarians and vegans. There are no side effects listed on the company’s site, but further research shows that alfalfa can have a mild diuretic and laxative effect. Further, chlorophyll can cause an increased sensitivity to the sun in some people. If you have any long-term health concerns it is always advisable to consult a health care practitioner before taking a new supplement. There is not sufficient research on the safety of this supplement for women who are breastfeeding or pregnant, so it would be advisable to consult a doctor before use. One 90-capusle bottle is available for $15.95 from the company website. They also have a buy three and get one free offer for a total cost of $47.85, which offers a savings of over $15. The manufacturer offers a 100% 60-day money back guarantee. There are no customer reviews on the company’s website or elsewhere, so it is impossible to say for certain whether it is truly effective. However, for those using this for the first time, the product guarantee does offer some protection if you are unsatisfied with results or quality. Chlorophyll and alfalfa are both scientifically proven to improve overall health, and combining them together in a high concentration makes a potent supplement for overall wellness. These two ingredients are also beneficial for improving body odors by acting as an internal deodorant. Although the price point is good and the product comes with a decent money-back guarantee, the lack of customer reviews anywhere does create some uncertainty about the overall effectiveness of the product. Tim McClure	reviewed Vitabase Chlorophyll	on January 20th	 and gave it a rating of 3.